The Bioneers speaker series has ended. The MCC Community would like to thank everyone that participated in the past ten years of amazing speakers, panels, businesses, nonprofits and everyone else. "Bioneers" are social and scientific innovators developing solutions for a more sustainable world. Learn all about the National Bioneers, their work and their annual conference at www.bioneers.org. 2008, 2009, 2010, 2011 and 2012 National Bioneers Conference DVDs available for loan at MCC Library. 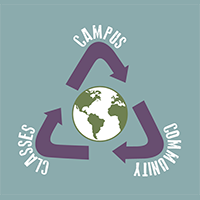 Email sustainability@mchenry.edu for more information.